Shawnee is a western suburb of Kansas City, Missouri. It is located in the northwest portion of Johnson County in Kansas. The city’s population is about 63,000 according to the census taken in 2010. Shawnee was recognized by Money Magazine as number 17 on the Best Places to Live survey because of its affordable housing, air quality index, and median commute time. 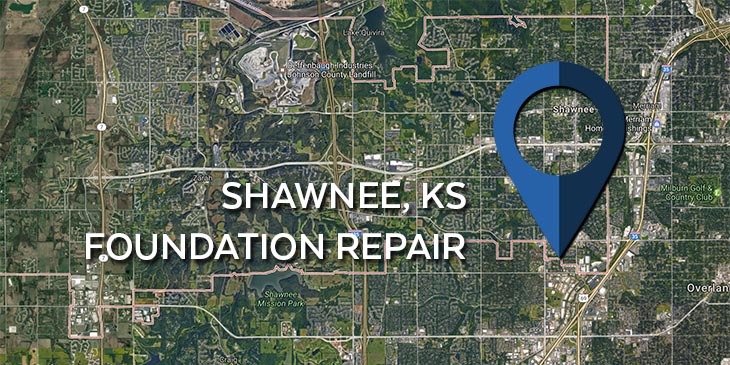 KC Pro proudly serves customers needing foundation repair in Shawnee and surrounding areas to ensure a safe living environment. Shawnee, Kansas has a rich history and examples of American Midwestern life. Shawnee was the area where the native people of the Osage tribe once lived. The political and religious center of the Shawnee Indians thereafter was where the immediate origin springs from. During the 1840s and 50s the Oregon, California, and Santa Fe trails traveled through this area on their way to the west. For those of you who live in Shawnee if you notice that you are having foundation problems in your home such as cracks, leaning walls or chimneys, or sinking foundation, then KC Pro can solve your foundation issues. For foundation repair and the surrounding areas KC Pro fixes your home so it is safe and sound. Soil-related disturbances tend to be a large factor when needing foundation repair. Poor compaction, overloading, and excessive materials that expand and shrink with the changes in the moisture content greatly impact the amount of stress on your home’s foundation. KC Pro has several foundation repair systems to overcome the damage already done. The most common solution to a settling foundation is a process called underpinning. When we underpin a foundation, our team will use helical and steel piers to help provide structural support and relieve stress. The first thing we’ll do is drive the piers deep into the soil below your home until they reach the stable footing from bedrock, the opposing end is then attached to your foundation. It’s as easy as that. Foundation damage often brings water leakage with it. When there are cracks in the basement of your home you can be sure that moisture will find it’s way in. The longer you leave these problems unattended the more money it could cost you in the long run. KC Pro has the services and products you need to make your home a safe and happy living environment. Our professionals not only deal with foundation repair, but we also know how to take care of all basement waterproofing repair needs. With our many waterproofing services to choose from, we have you covered. Whether you need a simple wall crack injection or exterior waterproofing installed, our professionals can handle it. Since we are a full foundation repair company, we know how to handle basement waterproofing needs.